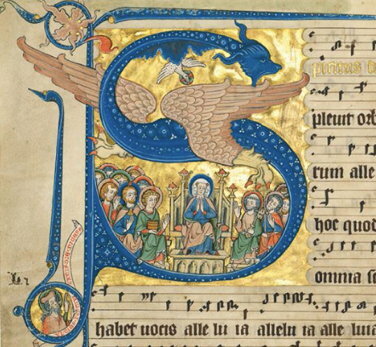 Of the approximately 500 mss copied by nuns that survive from medieval Germany, none stands out quite like “Codex Gisle”, a magnificent presentation Gradual in courtly gothic style with about 1500 Gregorian chants adorned with 53 elaborate historiated initials with striking gold leaf. It gets its name from the Cistercian nun Gisela von Kerssenbrock (d.1300) who, according to the memorial inscription on fol. 1 in an early 14th c. hand, copied and illuminated it for her convent of Marienbrunn in Rulle near Osnabrück (the ms unfortunately lacks its last folios where a conventional colophon would normally appear). Already known to art connoisseurs through a fine but partial collotype facsimile published in 1926 with the participation of the art historian Martin Wackernagel, the manuscript will now be given its due worth in a complete and exacting fine arts facsimile by Quaternio Verlag of Lucerne, great news for many disciplines, including art, music, religion and women studies. Although much has been written in the past 10-15 years about the role and activities of women monastic communities (e.g. Hamburger, Cyrus, Smith, Oliver to mention a few), how exactly this Gradual came about and was used at Marienbrunn we will never know. While the practice of women celebrating the mass was generally frowned upon by male authorities of the Church, liturgical and other devotional books were an important part of a convent's library and some of those books clearly supported the convent’s daily rounds of community prayer. 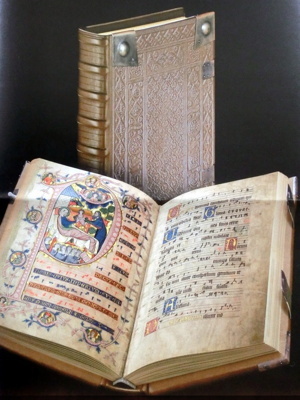 Given the fact that Codex Gisle represented a considerable financial investment, and that its size—35.5 x 26 cm—is actually not suited to singing from by multiple singers, the MS is best understood as a presentation-reference copy, a symbol of wealth for the convent, carefully guarded in the convent’s library, and likely brought out for special feast days. Traditionally, as all Gregorian chant was performed by heart, the nuns would have memorized this repertoire. It should be pointed out that Gisela’s authorship of the Gradual is not entirely clear. 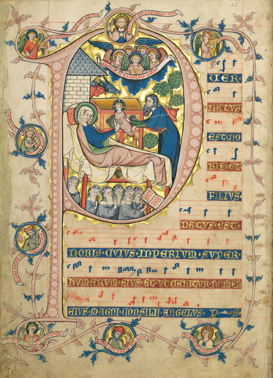 Evidence of multiple text and music hands as well as multiple artists add to the uncertainty, along with artwork that introduces her image, somewhat unconventional in a service book: in the Christmas chant “Grates nunc omnis reddamus domino deo” she is shown singing with five of her nuns; and in an Easter introit Gisela is shown kneeling in prayer reminiscent of the Virgin Mary. Yet the likelihood of the MS being a product of the convent of Marienbrunn seems irrefutable. While Gisela may have been responsible for its compilation, we cannot rule out the possibility that it was a collaborative effort or created by her sisters to memorialize their influential choir mistress, supervisor of the library and scriptorium, responsible for organizing the choir and soloists, and providing her nuns voice instruction. 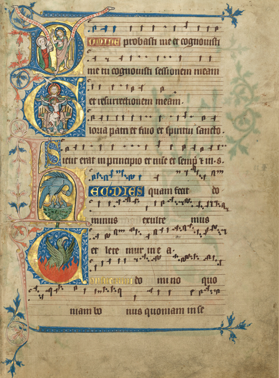 The chants in the codex are written in late 13th-c.—early 14th-c hufnagelschrift, the traditional German gothic version of Gregorian quadratic notation. From a musicological point of view, very scant information is available on Codex Gisle, hopefully this new facsimile edition will be an incentive for new research into the chant tradition at Marienbrunn. We are fortunate that some of the repertoire has been included in recent early music performances available on CD (“Crown & Veil—Music from Medieval Female Monasteries”—Sequentia/Ars Chorali; “Planctus: Laments of the Virgin Mary in German Medieval Codice”—Ala Aurea). 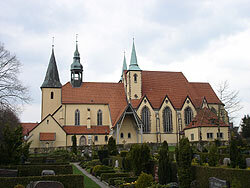 The Dioceses of Osnabrück, in existence since the time of Charlemagne, experienced an economic boom in the 13th century. From 1246 to 1247 a small community of Cistercian nuns moved into its newly founded cloister of Marienbrunn in Rulle, north of Osnabrück, the first of 25 Cistercian nunneries in Westphalia to be founded in the 13th century. A vassal of the Bishop of Osnabrück had donated it in hopes of salvation for his soul. 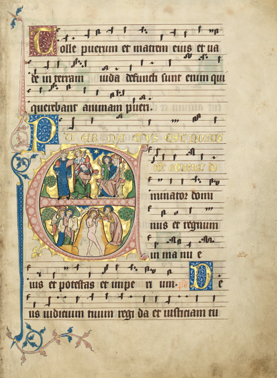 The nuns sang their repertoire based on Gisela’s Golden Gradual for 500 years. When the community was dissolved in 1802 during the process of secularization, the precious manuscript came into the possession of Karl Klemens von Gruben, the auxiliary bishop of Osnabrück. Today, the Golden Gradual of Gisela von Kerssenbrock is kept in the Dioceses Archive in Osnabrück.